Rainn Wilson is an American actor, comedian, writer, director, businessman, and producer. He is best known for his role as Dwight Schrute on the American version of the television comedy The Office, for which he earned three consecutive Emmy Award nominations for Outstanding Supporting Actor in a Comedy Series. A native of Seattle, Washington, Wilson began acting in college at the University of Washington, and later worked in theatre in New York City after graduating in 1986. Wilson made his film debut in Galaxy Quest (1999), followed by supporting parts in Almost Famous (2000), Steven Soderbergh's Full Frontal (2002), and House of 1000 Corpses (2003). He also had a recurring part as Arthur Martin in the HBO series Six Feet Under from 2003 to 2005. 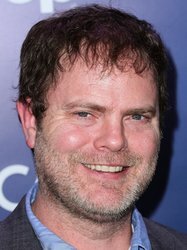 Wilson was cast as Dwight Schrute in The Office in 2005, a role which he would play until the show's conclusion in 2013. Other film credits include lead roles in the comedies The Rocker (2008) and Super (2010), and supporting roles in the horror films Cooties (2014) and The Boy (2015). In addition to acting, Wilson published an autobiography, The Bassoon King, in November 2015, and also co-founded the digital media company SoulPancake in 2008.